There’s something about the weekend that often makes us want to indulge a bit. Todays’ gluten-free muffin recipe for March Muffin Madness (MMM) gives you a little indulgence–but, admittedly, it’s a fairly healthy indulgence—and our sponsors give you some more terrific giveaway prizes! Chrystal of Gluten-Free Palate creates classic recipes that taste every bit as good as the gluten-full alternatives, with minimal ingredients used. 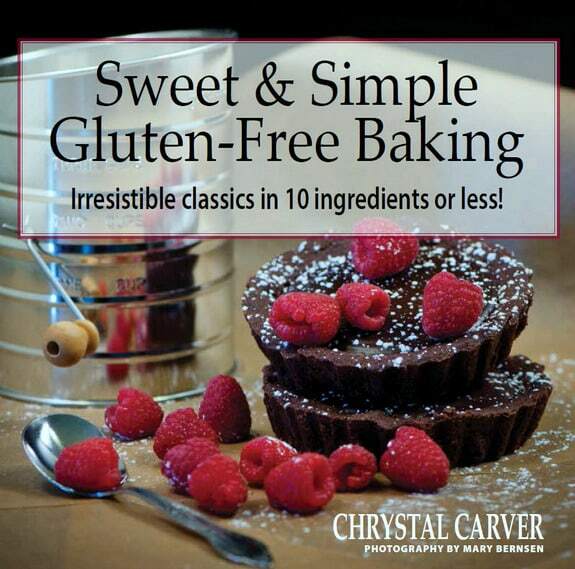 Chrystal is also the author of Sweet & Simple Gluten-Free Baking: Irresistible Classics in 10 Ingredients or Less!, which is part of today’s giveaway! 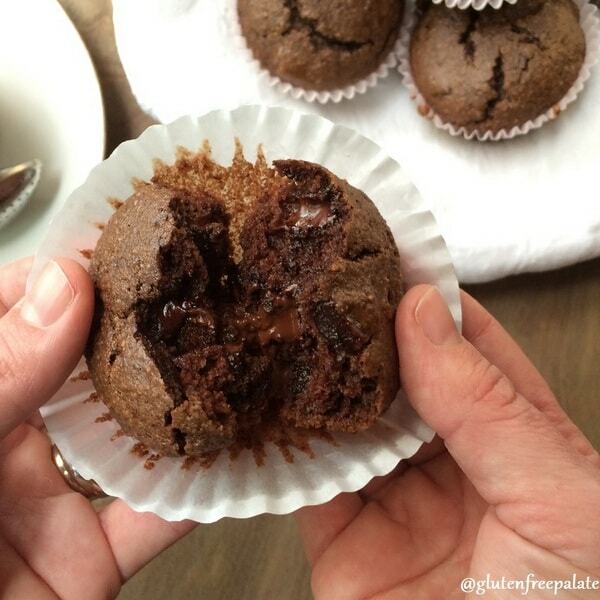 For MMM, she’s sharing these Paleo Double Chocolate Muffins. Chrystal said that she wanted to create a recipe that would work for those with additional dietary restrictions and shares: “These muffins are fluffy, tender, and perfectly palate-pleasing. They were insanely delicious fresh out of the oven and just as enjoyable reheated the next day. My girls don’t tend to like muffins with almond flour in them and they were so fluffy they couldn’t tell the difference. Shhh, don’t tell them!” How can anyone resist a muffin recipe that is described as “fluffy” and “insanely delicious”? I know I can’t! Confession: My favorite recipe of Chrystal’s (well, to date) is not a muffin recipe; it’s these Turtle Bars. Swoooon, and made from only 5 ingredients! 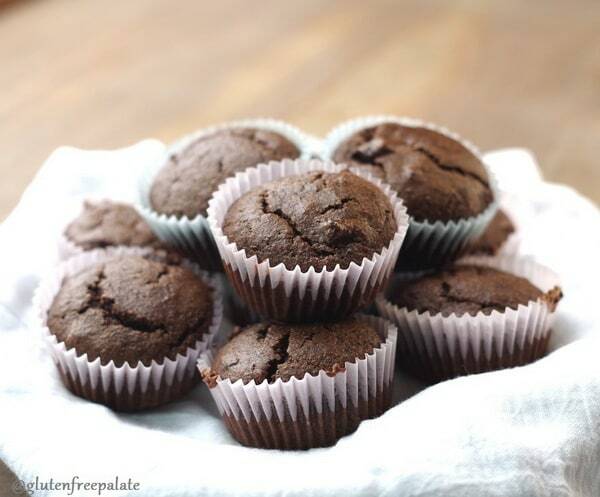 Before you head off to see Chrystal’s Paleo Double Chocolate Muffins recipe (and after you see the next photo you’ll definitely be ready to go! ), please check out today’s daily giveaway below. I’ll cut to the chase. Chrystal’s cookbook lives up to its title! 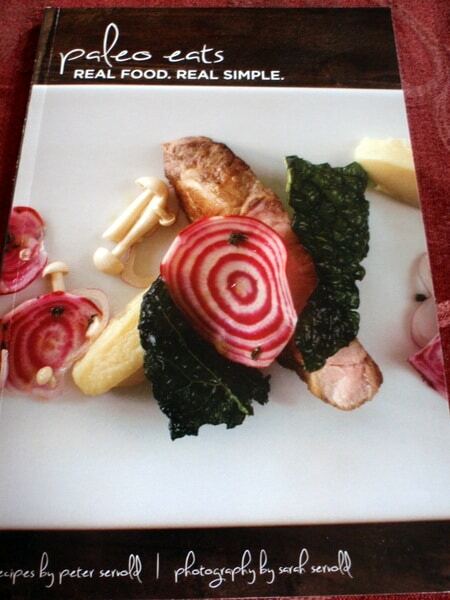 All of the reviewers on Amazon give this cookbook 5 stars, so I’m not alone in my opinion. Recipes include Angel Food Cake, Carrot Cake, Lemon Bread, Snickerdoodles, Gingersnaps, Key Lime Pie, Turtle Bars (again, swoon!! ), and so much more. 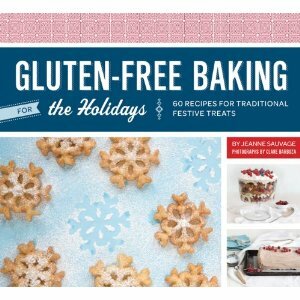 This cookbook comes from another good friend, Jeanne Sauvage of Art of Gluten-Free Baking. While so many recipes in this cookbook (recipes like Spritz Cookies, Stollen, and Cut-Out Cookies, Lebkuchen, Rugelach) are perfectly suited for holidays and festivals—some even for Easter and/or Passover—there are so many that you would happily make any time of the year. Think Chocolate Chip Cookies, Lemon Bars, Pound Cake, Skillet Cornbread, and Cannoli, and those are just a sampling. This book is critically acclaimed because its recipes work so well and they are lovely. You can read my earlier review here. This prize is a small and attractive cookbook with over 60 recipes—some classics and some new and super creative—written by Peter Servold. Pete is a Le Cordon Bleu trained chef and the owner/operator of Pete’s Paleo, a paleo meal delivery service. I previously shared Pete’s cookbook Paleo By Season: A Chef’s Approach to Paleo Cooking, which was photographed by his wife Sarah. Paleo Eats shares very similar recipes—most of which are three-part meal plans (e.g., Braised Short Ribs, Sauteed Kale, and Roasted Brussels Sprouts; Pan-Roasted Wild Halibut, Fennel Salad, and Parsnips). There are some “single” recipes like Classic Simple Meatballs, Butternut Squash Soup, and Borscht. There are very few recipes that are on the sweeter side, but the ones that are included—Sweet Potato and Banana Pancakes with Bacon Maple Sauce and Bacon Bars—are really good ones! Enter to win below and remember that every comment on every post during MMM is not only an entry for the daily giveaway, but is also an entry for the Grand Prize Giveaway. Be sure to claim additional entries for that giveaway below. You can see the up-to-date listing of daily prizes and the complete lineup of bloggers and recipes in the kickoff post here. Come back tomorrow morning for our first savory muffin recipe! And I would love any of the prizes – I am a bit of a cookbook addict……. Yum, chocolate is my favorite! And I’d love any of these cookbooks, but especially the sweet and simple one or the holiday baking one! Paleo and chocolate? Sign me up! The blender would be great to have and I will have to try the double chocolate muffins!! Thanks so much for the opportunity! I’d be interested in the Paleo Eats cookbook. So many great muffin recipes! Now I have to decide which one to make next. Not a complaint. Thanks, Shirley! I love new cookbooks and trying new recipes! These muffins look like a nice dessert! I must make this muffin recipe soon! And all of these cookbooks look like great additions to my collection! Paleo and double chocolate, yum!